We had just met, introduced ourselves. As soon as he heard I was from Norway he told me about Norway Street. I was at Øl Tokyo, a Norwegian bar in Tokyo. Of course I had to visit a Norwegian bar when in Japan. I bought myself a beer, Norwegian of course, had a small taste, when he started talking to me. He was sitting not far away from me in the bar. He was from Malaysia, visiting Tokyo on one of his many business trips. 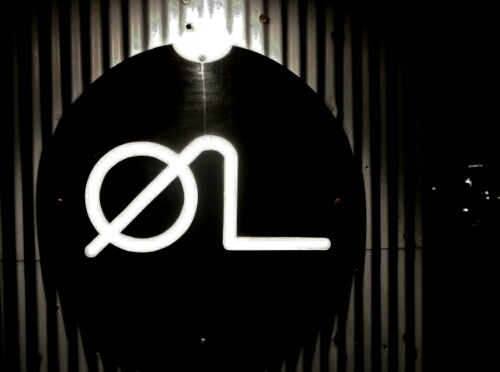 When Øl Tokyo opened earlier this year it had quickly become his bar of choice. Now he came here almost every night when in town. Located in Shibuya, Øl Tokyo, or Øl by Oslo Brewing Co. as it is now called, is a Japanese beer bar in Tokyo dedicated to Scandinavian culture and excellent craft beer. Located where the old Mikkeller bar used to be, Øl Tokyo opened in 2016. Its interior seems inspired by Norwegian and Scandinavian design, trying to get than Norwegian living room experience. 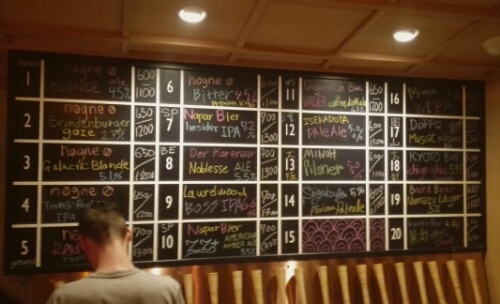 The bar has a large selection of beer on tap, many from Norway but also Japanese beer. Øl Tokyo does not serve food, but often invites food trucks to park outside, offering food to its patrons. I left Øl as it closed at midnight. It is cool to have a Norwegian bar in Tokyo, I liked the bar, but I don’t see myself coming here often. Why would I want to go to a Norwegian bar when travelling, especially in Japan? And one that where most of the visitors seemed to be tourists and expats as well. Norwegian bars I can visit in Norway, in Japan I want to go to Japanese bars. Walking into Fuglen Tokyo was like walking straight back to Norway. It really looked like a Norwegian café. Right down to the hipsters in way to small beanies and a Mac, sitting forever in the same seat, eyes glued to the screen, a small caffe latte getting ever colder on the table next to them. I had heard about this place since the first time I came to Japan. A Norwegian coffee shop turned cocktail bar at night, right in the middle of Tokyo. Now, on my fifth visit to Japan I finally managed to visit Fuglen Tokyo. I bought a coffee, felt I had to when I was here, went outside to sit in the sun. It was a nice day, not to hot. A few clouds in the sky but not enough to block out the sun for long. It was a very good coffee. I leaned back in my seat, simply relaxed. My friend did not get anything, he was busy with his phone. We were on our way to Asia Food Festival in Yoyogi Park, my friend was busy arranging to meet with a group of his mates. The original Fuglen is in Oslo where it has been open from 1963. After changing management in 2008, it reinvented itself as a cafe, cocktail bar and Scandinavian design showroom, in fact all the furniture at Fuglen is also for sale. 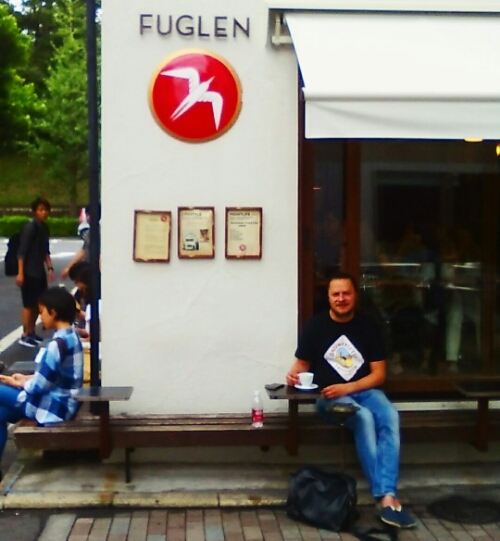 Taking a big risk in 2012, Fuglen opened its second store, on the other side of the world. In Toyko. The idea came after Japanese Barista Kojima Kenji came all the way from Japan to Fuglen to learn more of the Norwegian way of brewing coffee. While Tokyoites have favored a dark-roast coffee, coffee in Norway is usually much lighter, brighter, more citrusy. After learning all he could in Norway, Kojima Kenji returned to Tokyo to become the manager of Fuglen Tokyo. Success was not instant for Fuglen Tokyo, it seemed the lighter Norwegian Coffee took a while to get used to for the locals. Word eventually spread through the grapevine, and after a few favorable reviews in popular magazines the people of Tokyo looking for the newest and coolest thing flocked to the place. Today Fuglen Tokyo is a popular coffee shop by day, by night it turns into a classy cocktail bar. I finished my coffee, some very good coffee indeed, it reminded me of Norway even though the coffee was from Colombia. My friend was still on his phone. I waited for him, sitting outside, on a bench, the sun in my face. It felt good. I had finally done my duty, visited the Norwegian café in Tokyo. 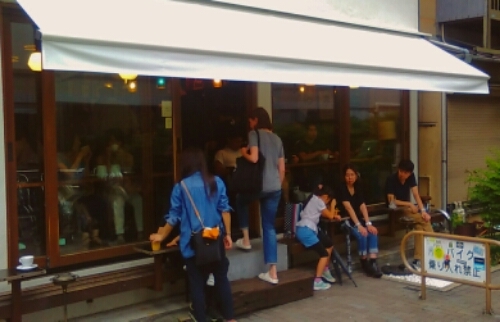 It is quite amazing that a café from Norway would open a branch in Tokyo, and that it would succeed. It just goes to show everything is possible, you just need to try. My friend finishes his conversation, he is ready to leave. Together we head over to Yoyogi Park for the Asia food festival. I haven’t been to Norwegian Icons, the furniture store yet. Buying furniture is not really on top of my list of things to do on holiday, I never found the time to just go there and have a look. But it is nice to know that Norwegian Icons, Fuglen and ØL Tokyo together have made a little bit of Norway appear on the streets of Tokyo. It might not be the street I would visit the most, why go to Norway when in Japan, but if I get homesick while in Tokyo I know where to go. And now you know where to go if you want a little taste of Norway in Tokyo. Osm post i liked for traveling.